Level up - Take it to the next level in your life! You must be a member of the Geneva Personal Development and Debate Group to attend this activity. Would you like to join this group? 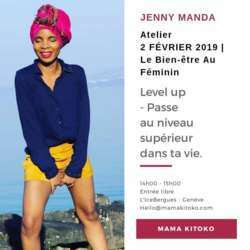 Jenny Neil, a personal development coach who has worked with many top athletes, will be hosting a workshop with a very promising title: Level up - Take it to the next level in your life! Feel free to visit the stands of the event highlighting the well-being and beauty of women. Could you please register only if you are really interested and to withdraw early enough if possible ?